I'm new to Freetrack and I'm having some difficulty with getting the curves right. When I play games with simplified avionics, my curves/profiles are fine. I set a small deadzone and then I'm able to look forward without my camera moving all over the place, while also being able to check 180 behind. This works fine for when I don't need to look inside the cockpit much. However, I'm trying to get into DCS: A10C and I just can't get the view working how I want it to. Ideally, I'd like a "deadzone" inside the cockpit directly in front of me, allowing me to carefully look over the controls; then having a faster look when I'm looking outside the cockpit's angle/area in front of me. This is for both pitch and roll. I'd also like to have another smaller, more-dead deadzone around the HUD (well, the centre of the screen). So, a small deadzone with minimal movement, then a larger deadzone encompassing the whole cockpit with decent movement (allowing for fine movement, though) and a quick moving viewing outside of these too zones. Also, is there any way to set up more advanced deadzones? It bothers me a little that when I'm not looking at the HUD/crosshair, but looking down at the cockpit controls, the view still "snaps" to the centre of the controls. I'm not looking at near the HUD/crosshairs, so I have no need for this vertical snap line. I imagine it's too complicated for this to be a setting in Freetrack, but I just thought I'd ask, in case it is. Basically, I'm just wondering how all the people I see on youtube playing A10C with Freetrack make it look so easy. I can't even get the pitch/yaw right, let alone the translation (I'm terrible at getting the translation settings right, so I've all but given up on them). Any help would be greatly appreciated. I'll keep trying, but whatever I try it seems to feel unnatural and very much less smooth than people I've seen using it. 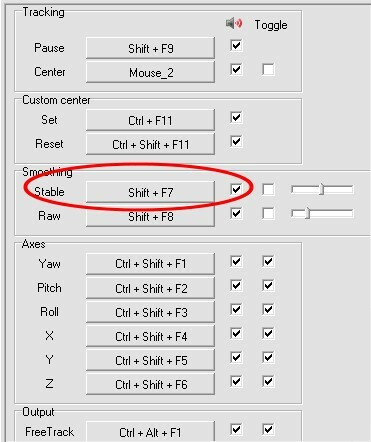 did you try the funtion smoothing stable/raw at the control tab? You can asign a command to temporary make your view more stable or raw. You can also create a second centre view.I use it to have a quick view at my dashboard. I use the toggle function for center my view so my view get pauses till I press it again. Did you change something at the global tab? What settings do you use for smoothing an sensitivity in your profile?When I know your settings I maybe can understand your problems better. I hope this can be of any help for you. Edited by Stormrider on 09/03/2013 at 13h36. I haven't tried the smooth/raw controls - I don't know what they do. I thought smoothing might just be like mouse smoothing, making view have more momentum (for lack of a better word). I'll give it a try later and see how it goes. Maybe I'll try playing around with the smoothing sliders too. Is the second centre view created using the "custom center" set key? Does this replace my centre or does it mean that my view will "stick" to two different area? Thanks again When I have time again I'll give these a try. 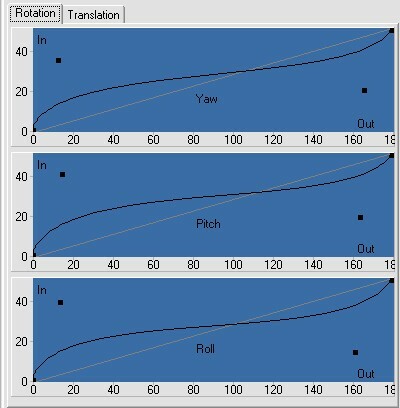 Low sensitivity and some middle smoothing in particular on yaw and pitch, to render your main movements less nervous. High zoom smoothing multiplier to fix the movements in zoom view when you lean forward, (instruments, outside zoom-view). Dynamic smoothing reduction: Good acceleration in quick turns. Middle deathzone in centerposition with good stable center- and 180° back-view. You dont need S-curves for translations. But push all curves to 180°. At least. There are no settings for different death-zones, but you can use a key function to toggle between stable or raw (as Stormrider mentioned). That gives you more or less "S multiplier"-value on all axis. You replace your center with the custom center( no second center, but an other center).I have a programmable keyboard and asigned it to a key.With one click I change my centre to another place when I need to.With reset I go back to the normal center. From my experiance I have learned, if you put sensitivity to high, you also have to put the smoothing higher.It didn't looks natural. 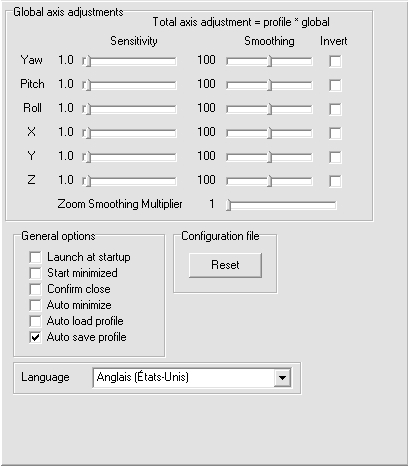 Stable (default Shift + F7): Smoothing multiplier multiplied by specified amount. Raw (default Shift + F8): Smoothing multiplier divided by specified amount. 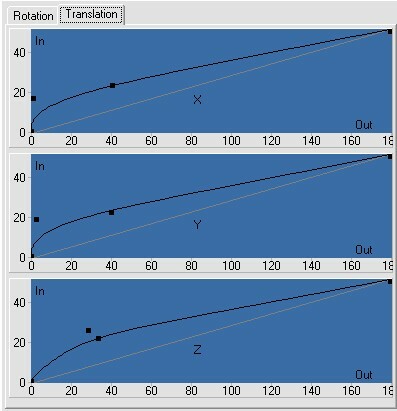 Use the associated sliders to specify the amount of change applied to the smoothing multiplier. 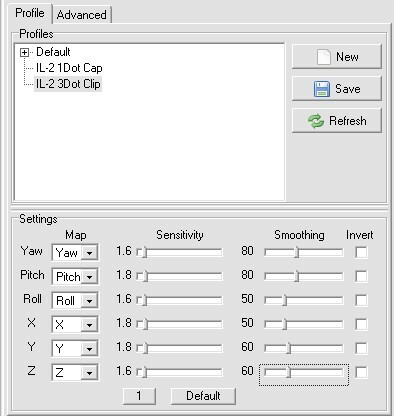 The state of each control is displayed in the data panel along with the smoothing value. The smoothing multiplier turns yellow when smoothing is greater than 1 and cyan when it is less than 1. 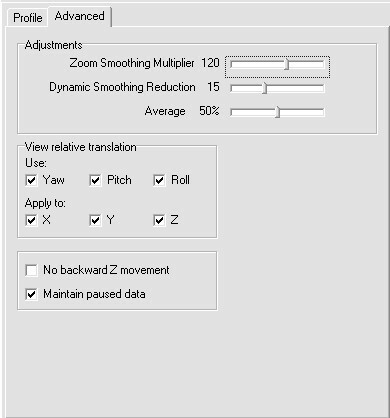 If you did not enable toggle, you have to keep the key pressed to use stable/raw smoothing. Be carefull with asigning keys to those functions.I made once a mistake.With one key I changed the throttle of my plane and my view. Iam sure, everyone who started with freetrack had the same problems. Awesome! Thank you both, Steph and Stormrider! Those curves make a lot of sense to me Steph - I had trouble visualising what they should look like for what I want, but the ones you posted seem to be what I want. Thanks for all of the other settings too - I now have an excellent base for finding what works for me. I have a programmable keyboard and asigned it to a key.With one click I change my centre to another place when I need to.With reset I go back to the normal center. Nice idea, I will keep this one in mind for my G110. Edited by Steph on 09/03/2013 at 16h58. Thanks a lot Stormrider. I tried calibrate it for a couple of hours, And i searched almost all the Internet to find solution. With ur configuration it works perfectly.